Yesterday Keri was able to do a Skype interview with a news station from Delaware. Below is the print version of the piece and here is the link where you can view the whole story and watch the video. WBOC reported Monday a 14-year-old Felton boy died over the weekend. It’s been around for years but has seen a recent resurgence in popularity through social media. It’s a very serious, very dangerous activity that has claimed the lives of many kids nationwide, like that of Joshua Engle, an Iowa boy. Engle died three years ago playing the choking game. He was 13 years old. His sister Keri Anderson remembers seeing her dad and mom right after they found Joshua. Anderson says recognizing the warning signs is one of the most important things parents can do. Those signs include bruising on the neck, frequent and severe headaches, bloodshot eyes and finding items like belts, ties, scarves left around. “Unless you know what you’re looking for, you would bypass them and give them a different reason,” Anderson said. There’s lots of information for parents available online, like YouTube videos showing what happens to the body during the choking game and how it can be deadly. Anderson says it’s important to talk with kids. And it’s key not to be accusatory. Anderson says it’s difficult every time she hears about a kid killed playing the choking game. “All the emotions just come back. You know it’s not going to be, but you can get through it,” she said. Again, DSP has not officially released a cause of death for the 14-year-old Felton boy. He was a middle schooler in the Lake Forest School District. District and school officials sent out notices Monday to families about what happened. 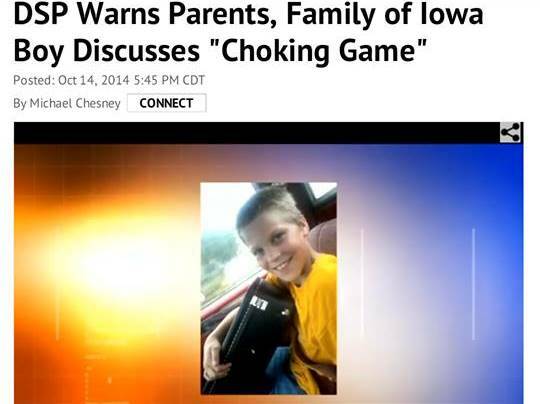 In a 2008 report, the Centers for Disease Control laid out the prevalence of the choking game problem. The report said the “game” led to 82 deaths nationwide between 1995 and 2007. Most of those happened from 2005 on. The majority of the kids killed were boys that were on average between 13 and 14 years old. In an unfortunate coincidence, Saturday, the day the Felton boy died, was Worldwide Choking Game Awareness Day.